Korouoma has been for a long time on my list of places to visit. 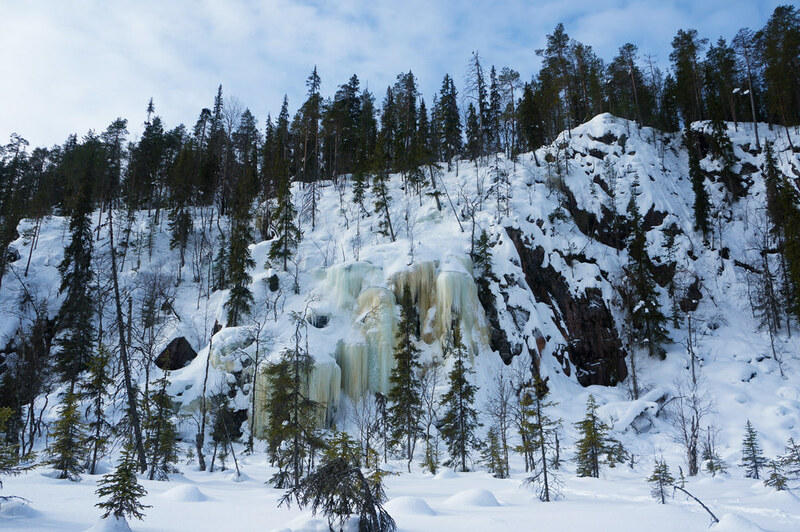 A long canyon with up to 100 m high cliffs, Golden Eagles soaring above in the sky, and a good dozen of icefalls to climb make this the best ice climbing destination in Finland. My fast & light trip to Korouoma started Friday afternoon as Heini, Mikko and their dog Alli picked me up in Vaasa, before us an eight hour drive to the north. After a late dinner at one of the countless ABC Stations along the road I dozed off on the backseat, awakening once in a while as we drove on empty roads further towards Posio and Korouoma. It was past midnight as we arrived on the parking place, and in the light of our headlamps and the moon we gathered our gear to start the descent towards the canyon. It’s very late as we arrive down at the Kota which the rest of the group is already sleeping in, and Heini and Mikko head inside while I sleep outside. 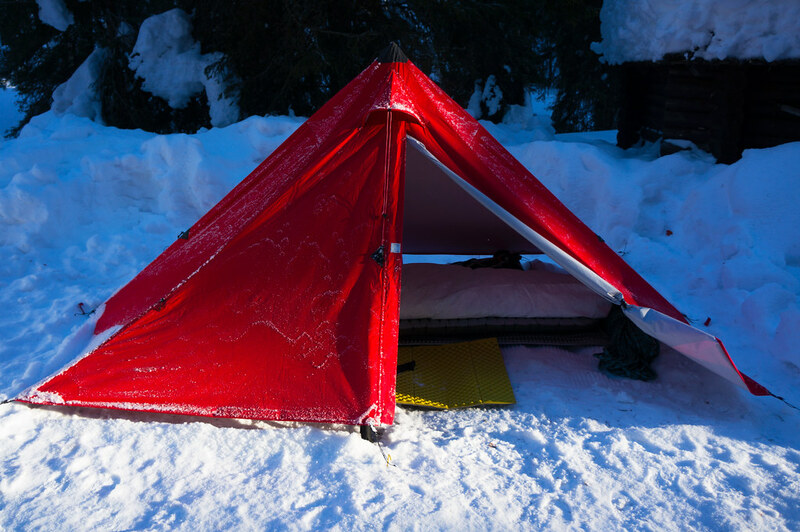 It’s so late, the weather is clear, so I just roll out my pads and the new Tyvek quilt cover I have on test and slip in my Katabatic Gear Sawatch while the moon shines over the valley. My watch says it’s -15°C but inside my quilt and down hoody I am warm and soon fall asleep. I wake up as at sun rises close to 6 o’clock, though as no one else is yet up I turn around and sleep a bit more. By seven o’clock the sun shines on my bivy spot and so I get up, a hot coffee - a Thermos bottle is a must on these trips - and I’m off exploring the surroundings, waiting for my climbing friends to wake up. No Alpine Start, it seems. To be productive I pitch my Khufu eVent II and sort all my climbing gear for the day ahead, and a bit past eight Mikko and Heini appear outside with Alli. We have breakfast together, and finally around ten o’clock Mikko and me set off to the icefalls. We pass Ruskeavirta, the longest and steepest icefall, but which we won’t climb yet. We walk onwards to the Mammutti icefall, a smaller and slightly easier climb for the start of the day. A group of people is already at the fall, and they have their first walking with crampons & iceclimbing lessons while Mikko and me look for a route. After we found a good line which suits us both, and offers a good belay & rappel possibility, Mikko is leading while I belay him. The wind is cold but the sky is clear, and behind us the sun is throwing long shadows across the canyon. As the majority of the climbs are on north-facing walls, we get no sun, though - it’s in the shadows where we climb. Six ice screws later Mikko topped out and established a belay spot, and I follow. I make my way up, cleaning up the ice screws and quick-draws he installed, and top out after a good climb. The view from up here, some 30 m higher now, is superb - we can see wide into the canyon to each side. The sun looks warm on the other side of the valley, while up here the wind & shadow keep us cold. Mikko lets me down and then follows with a rappel. Tea time. We snack and drink while discussing the next line. The other group climbed on a very wet fall and would like to climb our more dry line, so we let them and move more to the right. Steeper but a bit shorter, with a more exposed belay at the bottom, Mikko again sets off. While he climbs a Golden Eagle soars above us through the canyon, a majestic sight with its long, wide wings. Arriving at the ledge Mikko sets up a belay and I start my climb up. I arrive at the edge of the ledge with cold hands after having again collected all screws and quick-draws, slowly getting a hang of how to sort them on my harness so that they’re not in the way, as Mikko again lets me down. The plan was to build an Abalakov and abseil, though I was carrying the Abalakov tool and forgot to give it to Mikko. D’oh! Happily the other group is close enough with their toprope to Mikko, and so he is able to just clip into it and rappel down. We switch to the Revontuli icefall next, further down the canyon. The approach down in the valley is fast, as a well established trail leads through the snow, which at times is over a meter high. The walk up to the cliff is also easy, as two members of our group were just climbing there =) After two Lämmin Kuppi hot soups, chips and nuts I’m again warm and in good spirits, as is Mikko. Again we discuss the route, and decide that Mikko would climb to a ledge, then I follow and then we continue. Mikko, who climbs his third season on ice this year, gets up to the ledge, though as I follow the cold hands, a sure sign of gripping my axes to hard, return, and just as I arrive at the ledge I get a cramp in my left leg. Demotivated, I get down after I handed Mikko the ice screws and belay him further. After an exciting climb - Mikko droped an axe (leashes on Multipitch routes are handy!) and I provided him with a new one - we pack up and head back to camp, passing some of out friends who are still climbing. I take it slow, and photograph along the way. I head up to the foot of Ruseka Virta, from where one has a fine view over the valley looking south-east, and arrive after a nice walk at the Kota and my Khufu. 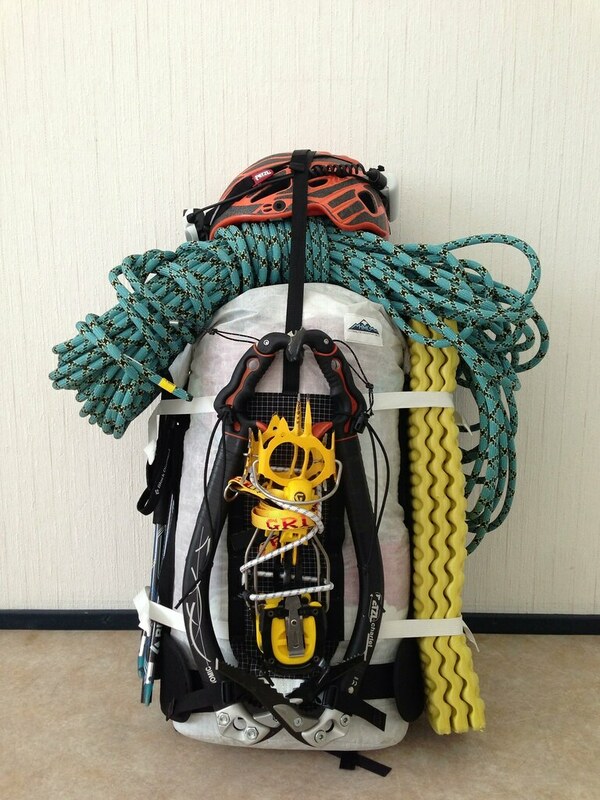 Slowly all the members and friends of Vaasa’s climbing club High Sport arrive at the Kota. 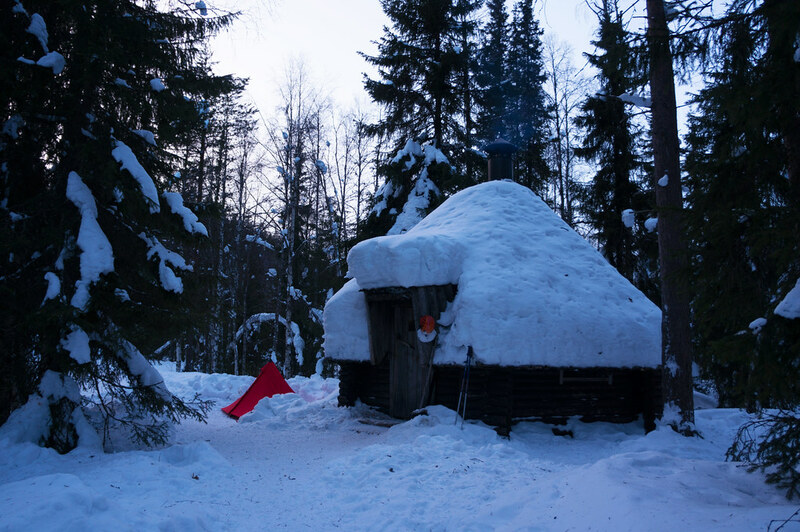 With a few Trangias and gasstoves on, as well as the oven in the centre of the hut, the temperature inside soon rises to sauna levels, while outside the thermometer again drops towards -15°C. Good conversations take place, though after a long day of climbing we are all rather tired, and by ten o’clock I slip into the Khufu, zip the door closed and fall asleep. A new morning and there’s again no Alpine Start, so I too sleep in till 8 o’clock. Coffee and breakfast in the kota, while I am thawing my shoes a bit by the oven. And of course more talk of where to climb today. Mikko and I settle on a small ice fall not far from camp, and a tad after ten o’clock walk over the snowshoe established trail direction north-west, until we reach the Enkeliputous ice fall. It’s a pretty fall, quite short but it’s still untouched and that also means we need to get through the snow till the base of the cliff. Which is easier said than done. Somehow if one carries ice climbing gear and a rope my elven skills of walking over the snow disappear, and I’m hip deep at times making my way to the cliff. We pick an easy starter route for the morning up the right side, and we both have great fun (see the video) on the route, for me it was easily the best climbing. We set a toprope for two of our friends, and then I rappel down, getting ready for a much steeper climb. And steep it was. While Mikko made his way up without problems, for me it was a real Suffer-Fest to get the steep ice up - crampons or axes blew out, I barn-doored a time or two, and felt like just going down a couple of times. But it’s mind over matter, and so I made it up, over the ledge and euphoric feelings of success were the reward. I made my way further up to Mikko and the belay spot, where we built an abalakov to abseil. Will it hold? went more than once through my head, though as I made my way down, and also Mikko abseiled after me, we both knew that we built a good abalakov. 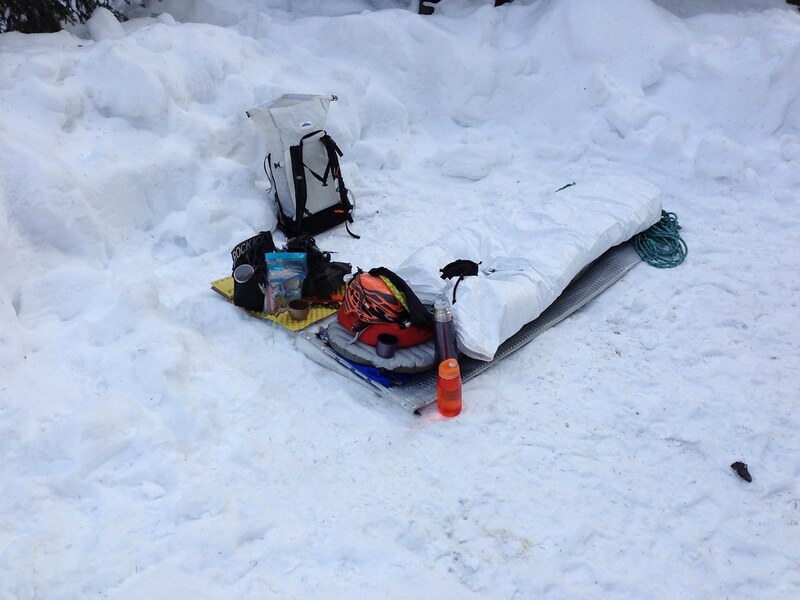 I toproped once more, and then packed up and headed back to the Kota to get my camping gear and head back to the car. A long walk up back to the parking lot later, which put the Gore Tex Active Shell membrane to a good, final test, I arrived in the sunshine on top. Storing gear, driving, eating at an ABC Station, and arriving before midnight in Vaasa - a superb trip. 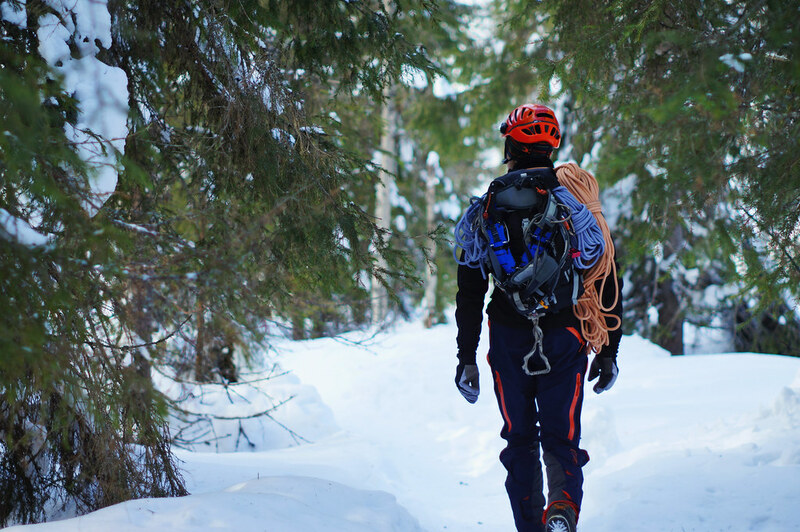 If you’re into ice climbing, life or visit Finland, then a visit to Korouoma is a must. 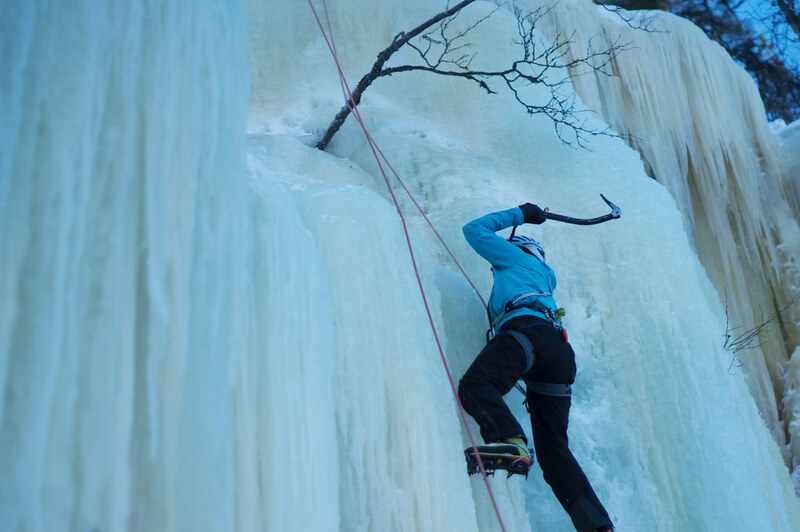 With it’s superb infrastructure (short approaches, free lean-tos, fire places, toilets as well as rental cabins) and the beautiful surroundings ice climbing in Korouoma is an experience you won’t forget. 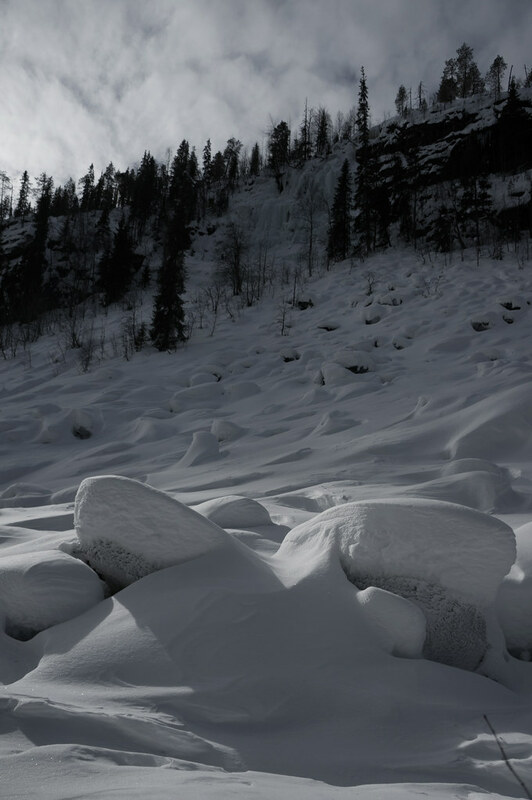 You can climb up to 14 different ice falls of different heights and difficulties in the canyon, all within about an hour of walking distance from the free lean-to shelters which are a mere 200 m from Ruskeavirta. 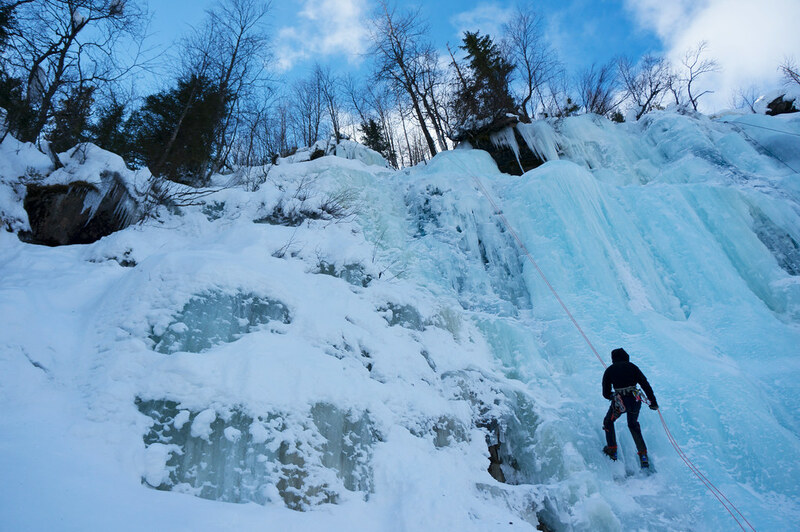 Some of the ice falls even offer paths for setting topropes if you’re not yet leading or want to first get a feeling for the fall. All in all I’m certainly returning next winter, and with the ice climbing season at Korouoma going from November till April (depending on the weather each year, obviously) maybe even more than once. Even if you’re not an ice climber Korouoma is worth a trip. 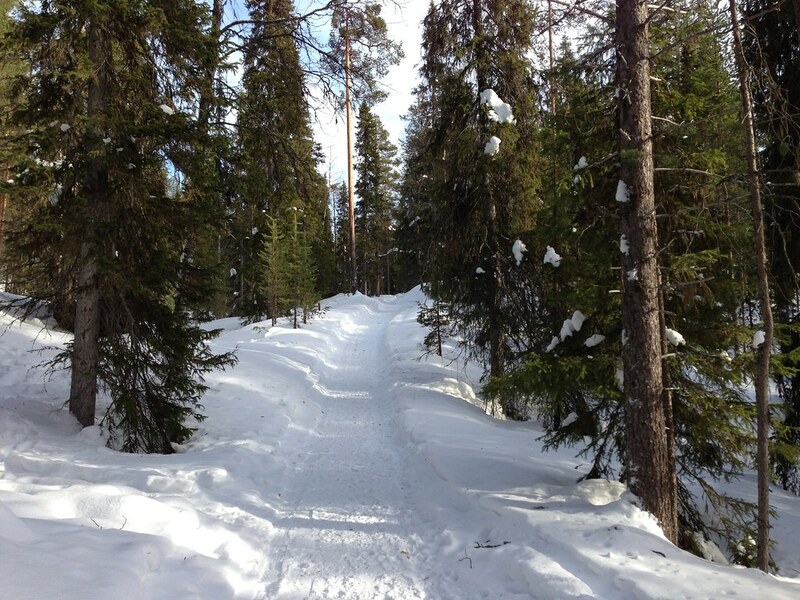 You can ski and snowshoe in winter, and enjoy the gorgeous scenery of the canyon with its unique flora and fauna. Golden Eagles, herbrich forests and great views are worth a trip at any time of the year, though I imagine in autumn when the leaves turn golden and red it is especially worthwhile. A very useful map with all ice falls in the canyon. Info on routes and some beta, and some more beta. General info on ice climbing at Korouoma, and more information on Korouoma. Getting there is easiest by car. Alternatives are flying to Rovaniemi or Kuusamo and taking a bus to Posio, from where one can take a Taxi to the Korouoma Parking lot. Ot rent a car in Rovaniemi/ Kuusamo to get there. 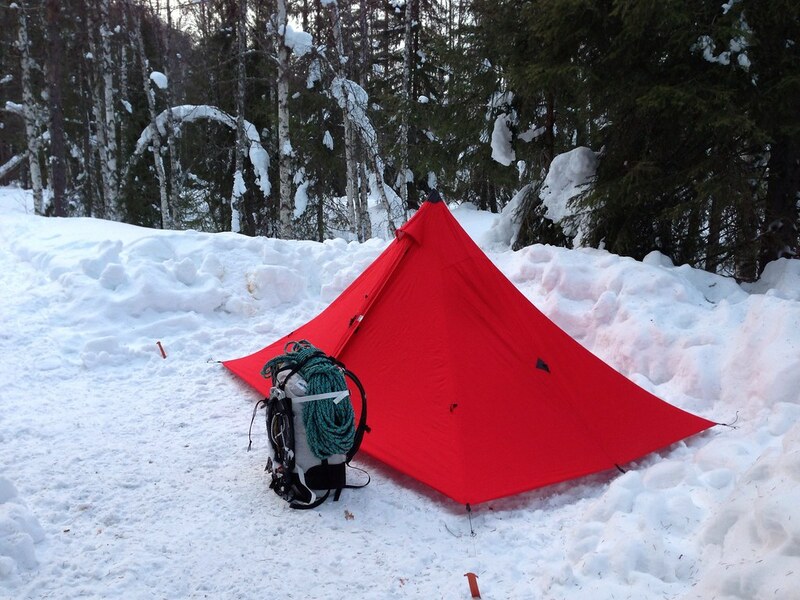 Accomodation is either own shelter/ tent, the free lean-tos which are all along the canyon, or some of the rental cabins of which the Piippukota is for climbers the best option as it is some 400 m from Ruskeavirta. There’s a gas stove at the Piippukota and some pans & pots, too.